Freiburg is a place that wasn’t on my list to visit, but that I absolutely loved once I was there. 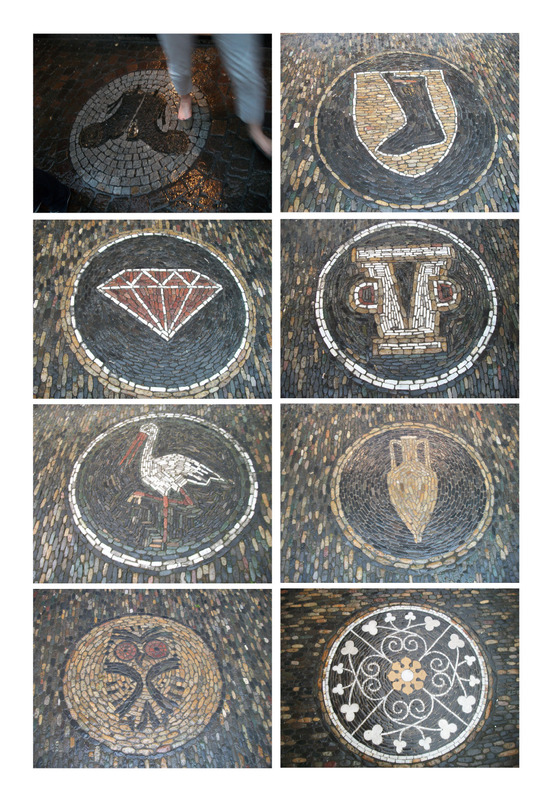 And in addition to the crazy amounts of wisteria, the tiny canals (called bachle) all over the city, and the flammkuchen (crispy pizza), one of the things I loved was the mosaics in front of businesses. Apothecary shops had a tile “A” in front. Jewelery shops had diamonds. A mattress store had a bed. The stork tavern had a stork. And so on. There are two photos of shoe mosaics because one was outside a shoe shop and one was outside a bar called Schlappen, which means shoe. Schlappen is my friend Sarah’s New Favorite Bar. She couldn’t get enough of that place – we went three times in two days.